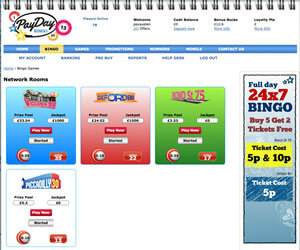 Payday Bingo no longer offer an affiliate scheme through which we can promote their brand. 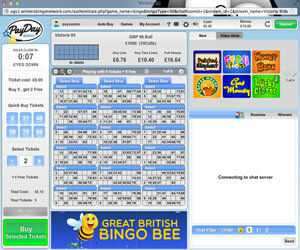 For this reason we have chosen to direct our readers to Comfy Bingo, another brand that uses the Cozy Games software. If you hear the word Payday these days, the first thing that springs to mind is those dodgy loan companies that charge a small fortune in interest; Payday Bingo however would prefer to see you win money then borrow it. 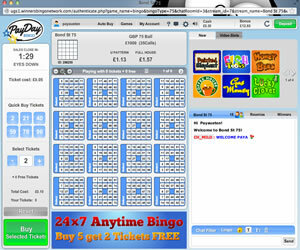 The Cozy Games powered online bingo site opened their virtual doors in July 2013 as part of the Winners Bingo Network which you may not have heard of before, but is home to brands such as Bingo Anywhere, Bingo Boat and Eat Sleep Bingo to name but a few. The Payday Bingo homepage is designed to look like a notepad for some unknown reason, and is a bit boring if we are being totally honest. The top of the page is dominated by a massive banner advertising their first deposit bonus offer, but the three women featuring on it who we guess are supposed to be smiling look totally fake with their open mouthed gazes. The rest of the page is made up of six large banners which link to different areas of the site and their social networking pages. 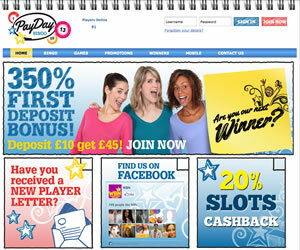 Payday Bingo welcomes you with a free no deposit bonus, but for some reason this is not mentioned anywhere on the site, so perhaps they are just hoping you will make a deposit before checking things out first? If you do decide you like what you see and want to play with your own money, you will earn a massive bonus on your first deposit followed by average bonuses on your second and third deposit, but please remember the more bonus money you receive, the more real cash you will need to wager before you can make a withdrawal. Click on 'Bingo' at the top of the page and you will be taken to the lobby which unlike most of the other software platforms out there, is just another page on the site and does not open up in a new window. Here you will find just four rooms, one for each of the variations of the game they offer; 30 ball, 75 ball, 80 ball and 90 ball bingo. Each room has it's own coloured banner and this displays all of the useful information you need including prize pool, jackpot, ticket costs and number of players. 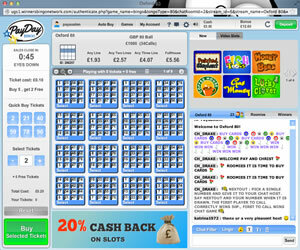 If you have played on any other Cozy Games powered bingo site, the rooms will look very familiar. To the left of the screen you will see a grid showing all of the balls as they are called and the center section is dedicated to displaying the cards you have purchased. 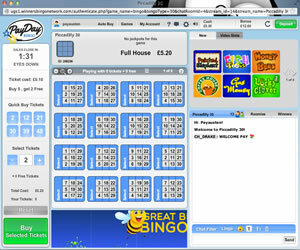 The right hand side of the screen is where you can enjoy a bit of banter with your bingo buddies or play a selection of mini games if you get bored. The software includes plenty of options including the ability to change your daub colour, pattern colour and even symbol with a range of shapes such as a butterfly and four leaf clover. Payday Bingo is sadly let down by their promotions and there is nothing that really sparks the interest and encourages you to choose them over the competition. They do offer daily jackpots but the value of these are very low compared to those you can win elsewhere. In addition to this, there is prize bingo but when they are asking you to wager at least £50 just to be in with a chance of winning prizes are only worth £100, you do wonder if it's really worth the bother. Payday Bingo is one of those average online bingo sites, they are not necessarily doing anything badly and there is plenty there to keep you occupied for a while, but one of the poorer software platforms combined with a lack of promotions will no doubt leaving you wanting in the long run. Payday Bingo is home to 30 ball, 75 ball, 80 ball and 90 ball bingo as well as a wide range of Casino Games, Scratch Cards and Slots. You should note that bonus funds can be used to play the instant win games as well as bingo. The wagering requirements are 4x the value of your deposit plus any bonuses on bingo games and 10x on all other games. A point to note is that you can only withdraw once every seven days and a deposit of £5 is required before you can cash out from Payday Bingo.